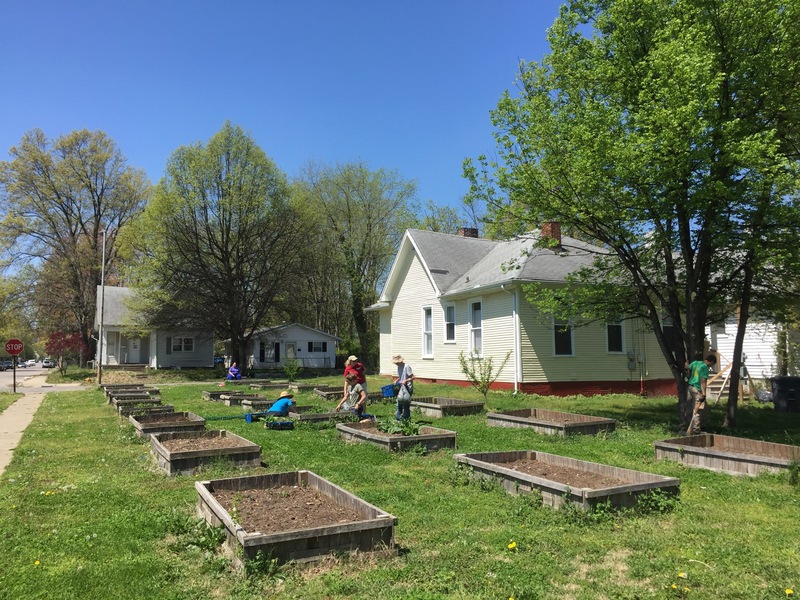 This spring the mission team in Evansville got to work on four projects: building two new modular homes, running a camp for children, organizing a food club for neighborhood women, and cultivating an urban farm. Like the cucumbers and purple bush beans that are pushing their way through the soil at the farm, these projects are in the sprouting stage, with much growth and fruit still to come as summer sets in. The projects are also bringing new people into the mix. Peter Putzier has moved from Servant Branch to take charge of the farm. Later in the summer, Orest and Susan Holovaty plan to move from South Bend to join the mission team, and about 20 more brothers and sisters will arrive in June to help with the camp, returning to their home locations at summer’s end. This is the second year for the urban farm. Last summer the farm yielded 700 pounds of produce, which the households divided according to the shares each had purchased at the beginning of the season. Some weeks the farm provided nearly all the produce for the missionaries, and they needed to buy little else. The planting for this year’s farm took place on April 16, a warm and sunny afternoon, and drew together missionaries and two families who are underway in the community, as well as several neighbors. The women and girls planted hundreds of seeds in a set of 22 raised beds: corn, peas, squash, even a box with flowers for cutting. The men and boys brought more soil over to the beds from another empty lot. Peter says the plan this year is to allocate 70 percent of the produce for community members. Another 10 percent will be given away to those who need it, and 10 percent will be sold at a farm stand or the local farmers’ market. The final 10 percent will go toward compensating neighbors who help on the farm. Next spring, they plan on expanding the farm substantially. They hope to provide most if not all of the produce for the households, to be able to sell a substantial amount, to be able to teach neighborhood children about the world and how to work, to produce food that can be used in the developing food club (see below), and perhaps even to be able to provide a source of employment for their neighbors. 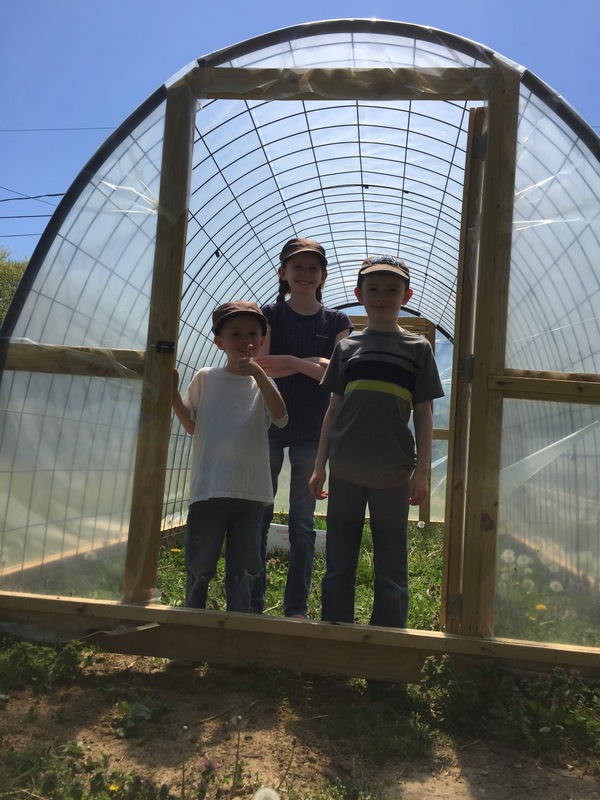 Caleb, Grace and Levi Sullivan inspect the portable greenhouse built by John Broxup, Peter Hammer and Jacob Hammer from the Buffalo branch. Chris Vieck has led a neighborhood women’s group in Evansville for almost six years. The women gather every week to put their lives in common, support one another and share life in Christ. Some of the members of the group are members of the People of Praise, some are not. A few months ago, a member of the group shared about a problem she was having. She needed a way to make her $176 food stamp allotment last the entire month for herself and her teenage child. She was also overweight, diabetic and having heart problems, so she needed to eat both affordably and nutritiously. The women’s group took this on as a challenge. They researched, planned and compared prices at several stores. Together they came up with a plan for the month and a couple of them took her shopping each week. She ended the month on budget. These events helped crystallize a vision for the food club—a place where women can come together to learn to plan menus, to shop, to organize their kitchens and to cook tasty and nutritious meals for their families–all on a budget. The club is starting small, with one group of seven women who are learning more about meal planning and shopping in hopes that they can share what they learn with other neighborhood women. “Practically all the women in the neighborhood have kids in the house and are responsible for making a home,” Chris Vieck says. Her hope is that they will be able to start more clubs and that, taken together, the clubs will serve as a network that connects neighborhood women and allow them to share more of their lives. Last year Paul Hommes, a mechanical engineer by training, formed a new company, Linwood Construction. Paul and his employees have renovated a house on the missionary’s target block and they have taken responsibility for managing most of the property owned by the community and its members in Evansville, currently eight houses and six empty lots. 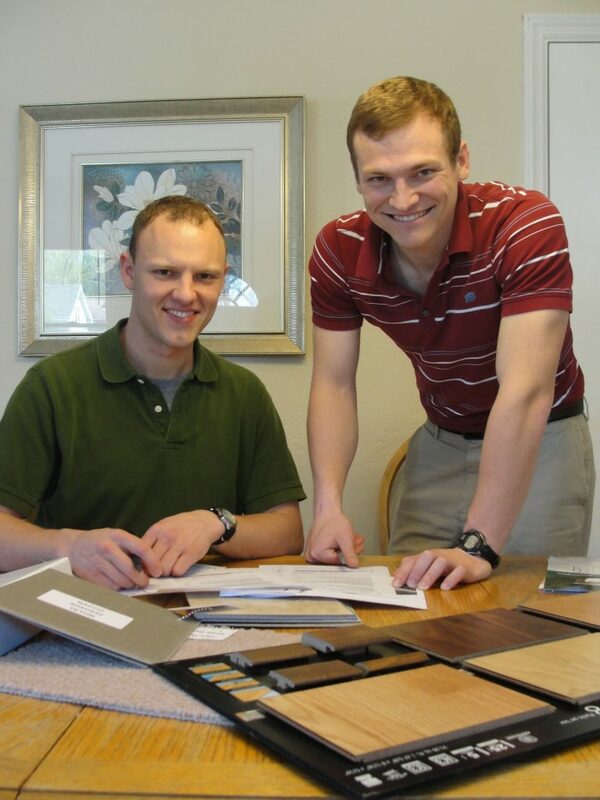 This year, Paul and his business manager John Earhart (also a mechanical engineer) have formed a partnership with Heckaman Homes of Nappanee, Indiana. Their goal is to place two new modular homes on the target block. One will be for Orest and Susan; the missionary sisters’ household will live in the second. Paul spent the month of April communicating with Orest several times each day by phone and email while also conferring with his contact at Heckaman in an effort to settle the home’s design and budget. Eventually, Linwood Construction will procure the necessary permits and the houses will be constructed in a factory in Nappanee before being shipped in several pieces down to Evansville. John Earhart (right) is the business manager for Linwood Construction, a company founded by Paul Hommes (left) to provide property-related services for the People of Praise outreach in Evansville. From the first moment they moved into the neighborhood, the missionaries have been interacting with local children; singing with them, teaching Bible stories and skits, organizing games and crafts. This summer, they will run their first camp, which Evan Lent and Mary Timler are planning. The camp will run from June 20 to July 8 and will be staffed by missionaries, high school and college students, and others sent by the Action program office. Jo Zimmel (Servant Branch), who helped establish the camps in Allendale and Indianapolis, will be on hand to lead the charge. The camp will be held on empty lots and at a local public park. Evan says the goals for the camp are to have fun, to learn about the Lord and to work on good relationships. He hopes that by the end of the summer they will have a foundation for relating with the kids that could eventually turn into something more. Just as in Allendale, he hopes this camp could one day feed into a Praise Academy. Nick Holovaty, who leads the mission team, says all four of these projects have been shaped by a consultation process that lasted more than a year. 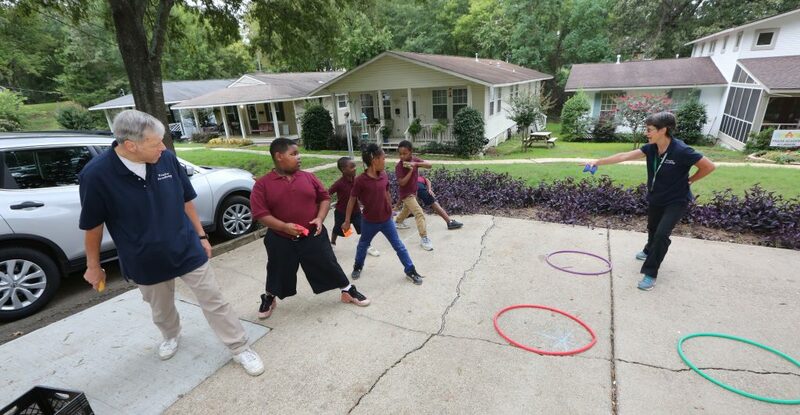 It involved knocking on 400 doors and collecting input from neighbors about the needs of the neighborhood and what they wanted to see happen. They noticed themes. There was a need in the neighborhood for dignifying work, especially for the men. There was interest among the women in learning more about meal planning and nutrition and about how to address nutrition-related health concerns, including child obesity. There was a desire to clean up the neighborhood and make it look better. There was also a concern repeated again and again for the children in the neighborhood, for their safety, for their need for purposeful activity and for them to learn more about the Lord. The mission team collated the input, brainstormed practical actions they could take, and then ranked their ideas by importance and feasibility before settling on these four. In addition to taking on these projects, Nick says, they continue to send out teams daily to knock on doors and share the gospel the same way the missionaries have done since they arrived in the city in 2010. Good to see the greenhouse with its plastic covering on! I chuckled a bit when you referred to it as portable, because it takes about five men to move it. Yes, it can be re-located, but it's not the kind of thing you'd want to do every week!